Glaucoma is a group of optic neuropathies that share a slowly progressive degeneration of the retinal ganglion cells and their axons, resulting in a distinct appearance of the optic disc and a concurrent pattern of vision loss (1). Glaucoma is the second leading cause of blindness in the world with estimates that it affects 66.8 million individuals worldwide (2); at least 6.7 million of these affected people suffer from complete blindness (2). 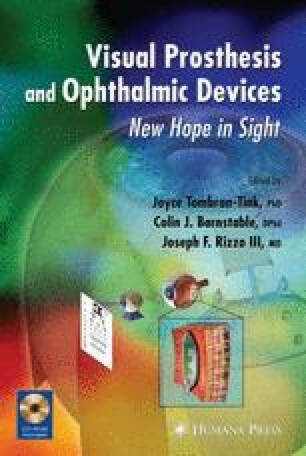 The vision loss associated with this disease is irreversible, yet the biological basis of glaucoma and the factors contributing to its progression have not been completely elucidated (1). Intraocular pressure (IOP) is the only proven treatable risk factor in glaucoma (1). As such, glaucoma is theoretically defined as a progressive optic neuropathy as a result of elevation of IOP above the physiological level of individuals (3). The upper limit of “normal” IOP, based on a large number of subjects, is internationally accepted as being approx 21 mmHg as a standard in the clinical diagnosis of glaucoma (3).